Junior Tennis Champions Center (JTCC) is a nonprofit organization committed to transforming lives through tennis in College Park, MD. As a nonprofit, JTCC is dependent upon charitable contributions to cover financial aid for student-athletes with verified financial need and to fund our Community Outreach initiatives. 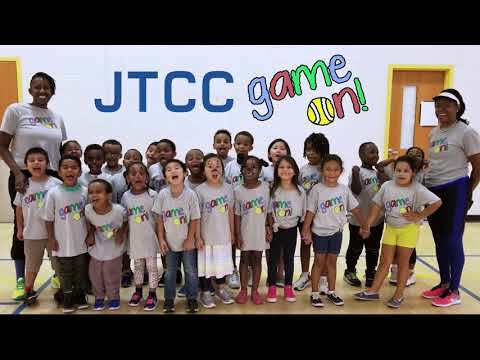 Starting in 2009, JTCC started a Community Outreach Program for children ages 5-11 from underserved areas of Prince George’s County and the District of Columbia. This program provides an opportunity to learn the sport of tennis through a combination of high-quality tennis instruction and educational enrichment activities. All of JTCC’s coaches are certified, which gives kids an excellent opportunity to train with high-performance coaches for free. Since early 2013, JTCC had distributed over 1,000 rackets out to our Community Outreach kids. Since its inception, JTCC has introduced tennis and life-skills lessons to more than 5,000 children in the DC area. A part of our Community Outreach Program is the Academic Creative Engagement (ACE) program. ACE is an out-of-school, nationally approved program that utilizes fun, interactive-tennis focused activities reinforcing math and English concepts thought in the kids’ schools. Teachers at ACE are highly qualified and have lesson plans that reflect and emphasize the importance of thinking, interpretation of ideas, and demonstrating knowledge connected to tennis. JTCC seeks to expand the ACE program to all community sites, so children participating in the program can have an hour of court time and an hour in the classroom. Our program serves around 1,500 local youth across the District of Columbia and Prince George’s County, MD each year. JTCC provides an opportunity for Community Outreach players to continue learning tennis with more advanced training at JTCC’s main site in College Park, MD. Many kids have excelled in our Outreach Program, so JTCC has offered over 30 talent children with financial aid and scholarships for tennis and education. We hope to provide more scholarships with the help of this fundraiser. JTCC is looking to improve funding for all of the community outreach programs in Prince George's County and Washington, DC. $25,000 will continue to provide more young children access to JTCC's after-school program that has potentially life-changing benefits for the participants. This includes supporting the current outreach locations and continued support for scholarships of our current Community Outreach children to have the opportunity to train in the pathway program at JTCC's main location in College Park, MD. $50,000 will allow the program to expand to 5 more schools and community centers in the DC Metro area and bring 15 more Community Outreach children to have the opportunity to train in the pathway program at JTCC. $75,000 will bring 60 scholarships to Community Outreach children, providing more chances to attend the JTCC pathway program and a chance at a college scholarship. $100,000 will help bring the ACE program to all of JTCC's Community Outreach schools. Currently ACE runs in our DC locations only. With this goal, JTCC will be able to provide this program to all of it's Prince George's County locations to help students succeed in the classroom as well as continued support of programs and scholarships. Founded in 1999, founder, Ken Brody, made 15 acres of land into a facility dedicated to growing the game of tennis and creating a lifetime sport for everyone. JTCC was selected by the United States Tennis Association (USTA) as the first Regional Training Center for its high-performance program and awarded USTA's Development Program of the Year, Organization of the Year, and Facility of the Year in 2013 and 2017. We are committed to becoming the best junior developmental training program in the world. JTCC offers a pathway for junior tennis players starting at any age to develop their interest in the sport to reach their full potential. There are specific age-appropriate programs for any child. Classes are offered daily, and schedules are flexible to meet everyone’s needs and level of commitment. More than 150 students are enrolled in the full-time and after-school year-round programs at JTCC with the number increasing to 700 players during the busy summer camp season. JTCC has produced seven players who have reached the top 10 in the world junior rankings and more than 50 Junior National Champions. Additionally, a small number have played or are currently playing on professional tennis tours including leading Americans Frances Tiafoe (#2 in the US and #35 in the world) and Denis Kudla (#8 in the US and #65 in the world). A total of 251 student-athletes have graduated from JTCC’s Champions program since the facility opened in 1999 and combined they have earned over 17 million dollars in academic funding to top Division I universities including Duke, Vanderbilt, UCLA, Michigan, and UVA. JTCC graduates have also been awarded millions of dollars in financial aid and academic-based scholarships enabling them to attend Ivy League and Division III schools, including Harvard, Yale, Cornell, Bowdoin, Middlebury, and Claremont McKenna.